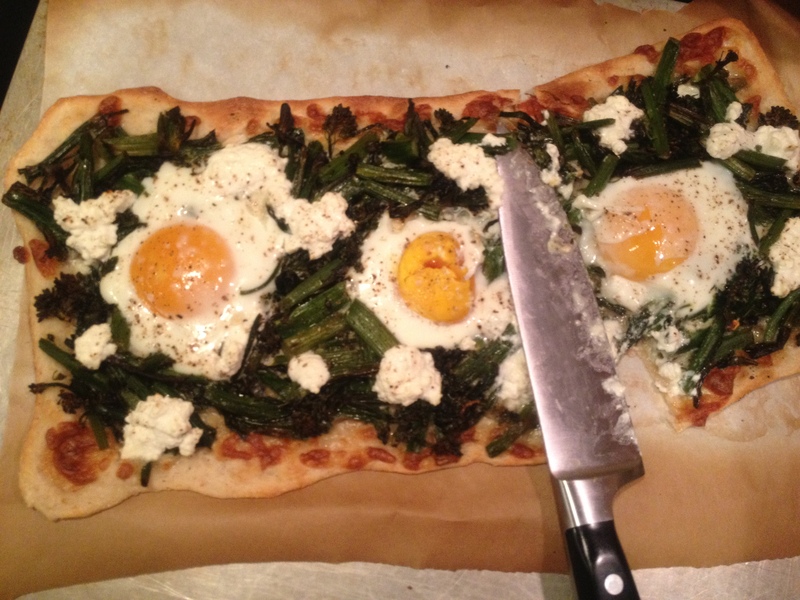 Roasted Broccoli Pizza with Feta Cheese and Eggs: Preheat your oven as hot as it goes. Thinly stretch a homemade or store-bought crust. Brush on a thin layer of olive oil and sprinkle lightly with mozzarella cheese. Top with piles of roasted broccoli (toss in olive oil and salt; roast at 450, stirring occasionally, until crispy in spots) and big chunks of feta, then nestle some fresh eggs down into little nests in the broccoli. Bake for 4-5 minutes on a hot pizza stone, or a bit longer on a hot cookie sheet, until the crust begins to brown underneath and the eggs are cooked to your liking. Serve with a salad, of course, maybe this one with lemon vinaigrette or this one with smoked salmon and creme fraiche dressing? LOVE eggs on pizza! We do pizza on the grill, which gives the crust that great crispiness. It’s almost pizza-grilling weather! Woohoo! Ok, that’s inspiring. This is the summer I’m going to try that. It’s the “throw the dough right on the grill” part that scares me! That’s a good combination! Lately (in a trick I learned from some local restaurant friends), I’ve been very lightly poaching the eggs for about 3 minutes, then throwing them on top for just the last couple of minutes of baking. Oh, that’s a great idea! I should try that! This looks amazing, Emmy! I love eggs on pizza. By far one of my favorite things. Especially when the yolk is nice and runny. Good for you for training your kids to like good food cooked well! I like mine runny too. Did I tell you I had a whole internal dilemma about it when I saw the quail eggs in that Jim Lahey pizza book? Because they were so darn cute. But no way were they runny after even a few minutes of baking! This is so pretty and very crafty of you not to break the yolks! It’s true that it looks better if you can keep the yolks whole, and it helps them achieve the perfect consistency. But the good thing about making a mistake of this kind is that it will still be very, very tasty!